Voltage Optimisation works by carefully controlling voltage to return an energy saving. Our preferred Voltage Management Solution stands out from other systems due to its high levels of control and efficiency. The Carbon Trust has produced a comprehensive brochure discussing Voltage Management. How does a business benefit from Voltage Management? It is now widely recognised that voltage control can generate substantial energy savings across an entire site provided the correct approach is applied. 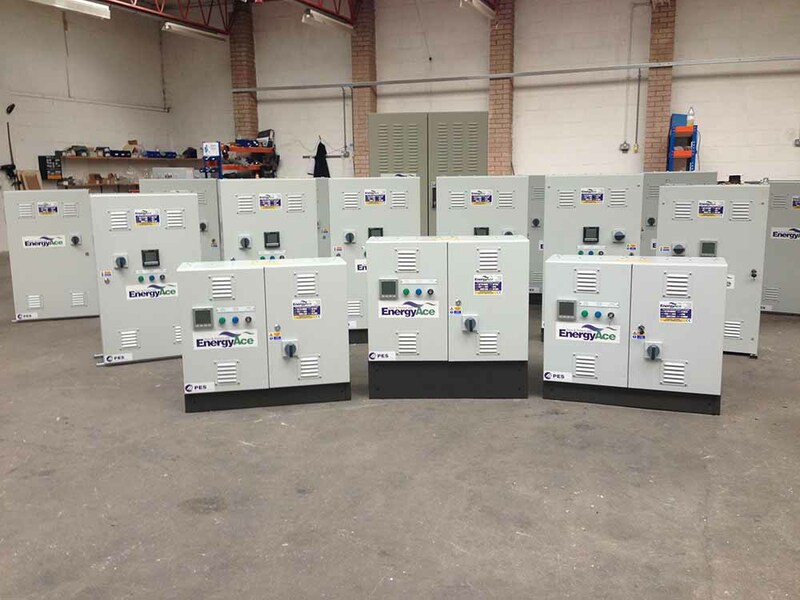 Our Voltage Optimisation solution not only ensures that plant and electrical appliances operate more efficiently and consume less energy, but also that electrical appliances last much longer. In most cases a site will have very little or no control over the voltage it receives as the national grid voltage fluctuates between 216v and 253v. The average voltage level across the UK is 242v while the voltage most appliances and plant operate most efficiently at is around 222v. Our product controls and stabilises the voltage to around 222v, this optimised voltage reduces maintenance and energy costs allowing appliances and plant to operate more efficiently and last much longer. Simply put, voltage can be described as a pressure, if you apply a higher pressure than need be to an appliance it will deteriorate quicker than it would when the pressure is optimum. Where is the science behind the solution? Voltage Dependant – A voltage dependent load is an electrical device whose power consumption varies with the voltage being supplied to it. Voltage Independent – A voltage independent load is an electrical device whose power demand, within its designed operating range, is independent of supply voltage. The two types of load above will react quite differently to a reduction in supply voltage, the voltage dependant loads will offer a greater energy saving, disproportionate to any reduction in output. The Voltage Independent loads will offer very little in way of energy savings. While voltage independent loads offer very minor energy savings through voltage reduction, they will operate at a much lower “pressure” and as such last much longer, reducing maintenance and replacement costs. A typical example of this would be LED lighting; an expensive LED Driver receiving the upper limit of voltage in the UK at 253v would be expected to be replaced before one receiving the more sensible and controlled voltage of around 222v, this could also apply to many other appliances or plant on site, especially lighting as confirmed by recent ECA testing. So are all Voltage Management systems the same? No, most Voltage Optimisation systems are loosely based on an Auto Transformer design and consist of a number of “tap offs” which offer very little control. In order to change the voltage output a shutdown of the whole supply is required and the attendance of an Engineer to “adjust” the system by moving cables to another “tap”. Safety – Standard Static Voltage Optimisation products simply transform the voltage down, once optimised and reduced this risks a low voltage situation. Dynamic Voltage Optimisation controls the voltage to ensure the correct voltage levels are maintained at all times. Dynamic Voltage Optimisation allows for the introduction of a low voltage threshold to protect the sites voltage levels. Once preset the voltage reduction system is bypassed if the threshold is reached to ensure the sites voltage is not compromised. Alarms can be introduced to alert the user of potential overload which is extremely important if the system has been matched to the size of demand and not supply. Control and savings – Improved control via stabilisation allows for maximum savings with varied voltage reductions applied automatically allowing target voltage to be achieved throughout the period of operation. It also allows for remote control of the voltage output to enable fine tuning of the Voltage Optimisation System without the need of a shutdown. The voltage output and low voltage threshold can be adjusted remotely and without the need of an Engineers attendance. Dynamic Voltage Optimisation would also normally allow for remote monitoring of all power parameters and power factors to enable the user to view energy usage in real time and act on any anomalies, this feature also allows for the generation of savings data and graphs to ensure full and transparent savings are achieved. Not all sites will benefit from the technology of Voltage Optimisation. Sites with longer opening hours, a majority of Voltage Dependent loads and an average voltage in excess of 235v will benefit most. The quality of the survey conducted before installation will directly impacts the quality of the installation and accuracy of savings, a poor survey will in most cases result in a poor installation and poor performance. Northern Utilities cannot stress enough the importance of a good quality survey and honest interpretation of the results to avoid over selling or misrepresentation. Northern Utilities and our voltage partner will always give honest advice and select the most appropriate technology product for the application. Voltage Management and Power Factor Correction (PFC) are highly complimentary technologies. We can provide a full package to meet your needs and offer maximum savings. Voltage Management saves up to 20% on general electrical loads and a massive 43% on lighting loads! Our preferred system is highly accurate and Smart Grid ready. Find out more.